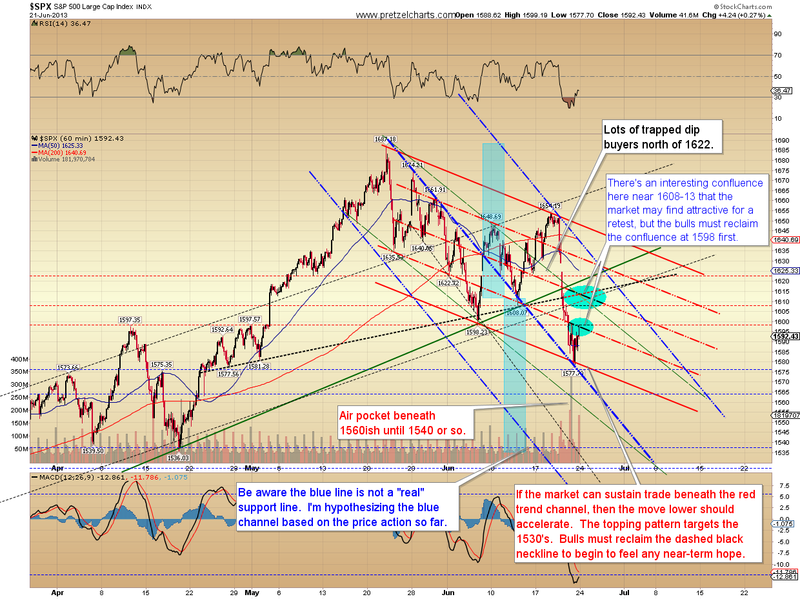 Pretzel Logic's Market Charts and Analysis: How Bearish Should We Get? How Bearish Should We Get? The market's job is to get you looking the wrong way, and to try to get you to do the exact wrong thing at the exact wrong time. It wants you to short when you should go long, and it wants you to go long when you should be shorting. Back in November, I began leaning bullish, but hesitated to commit to a long-term bull outlook until January, when I became exceptionally bullish -- probability the most intermediate bullish I've ever been publicly. 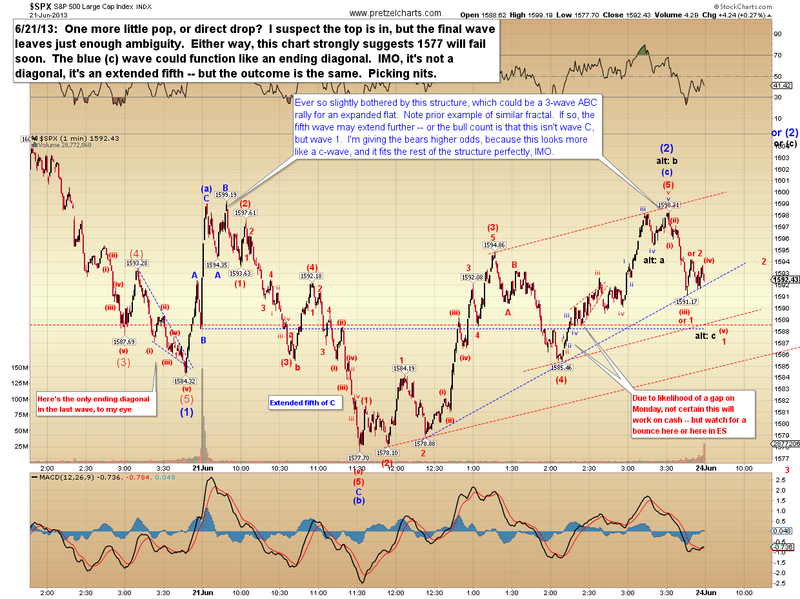 My updates were all about the rally continuing to new highs -- and the signs of strength I was seeing. Nobody read the darn things. I started trying to throw in some bearish stuff so as not to lose readers completely, since most everyone thought I was nuts talking about the S&P 500 rocketing upwards in a "nested third wave rally" to the 1500's and 1600's, and possibly even the 1700's. "What are ya, stupid? The world is a mess, dontchaknow." Believe me, I know. 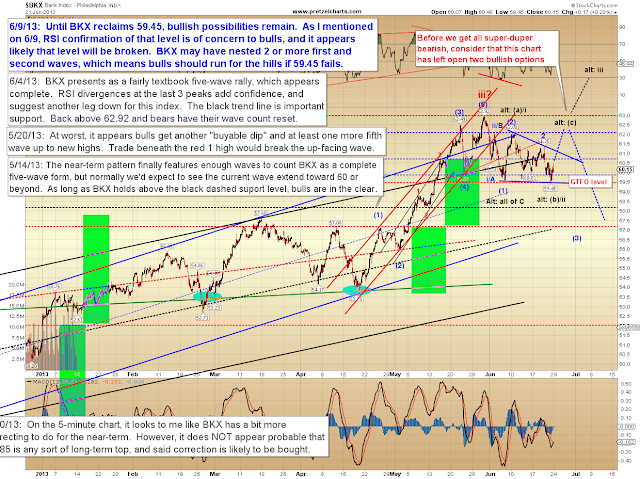 I've been fundamentally bearish for years. But I don't trade my fundamental bias -- my fundamental bias underpins my understanding, but it doesn't help me time the market. Near the end of May, after the SPX had rallied more than 200 points from January's prices, the mass psychology has reversed. Everyone "knew" it was stupid to ever take on a short position, just like everyone "knew" it was stupid to go long back in January. 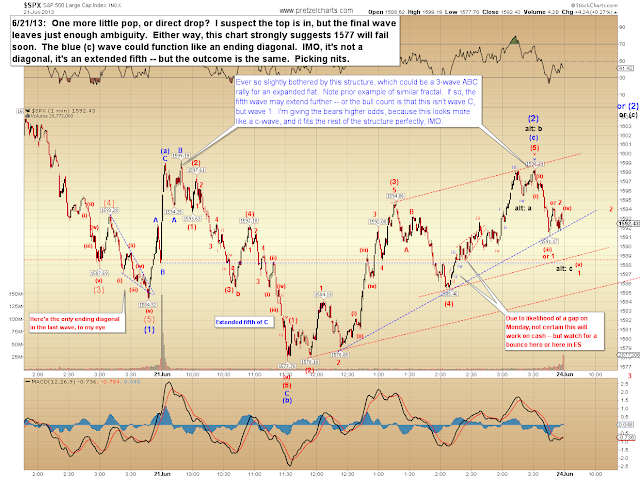 I assume most thought I was nuts when, on May 28, I suggested it might be Time to Sell the Bounce. I myself thought I might be nuts (and I said as much), especially after the SPX had reversed directly in the middle of May's target zone of 1680-1690. Unlike most people who become more confident after a string of good calls, I become more cautious and start challenging my assumptions all the more rigorously. I take this approach because the market will eventually rip your face off if you start assuming you are way smarter than it is. I learned that the hard way -- in fact, I'm not ashamed to admit that a bit more than a decade ago, I all but completely wiped out my trading account by going "max leverage short" at exactly the wrong time, after a string of good calls. I started thinking I had it all figured out, and decided (since I could do no wrong!) that it was time to knock one out of the park with a massive put options trade. When the trade started going against me, I stubbornly held to my previous views in the face of evidence to the contrary... and I clung to the trade until it was too late. It was an incredibly painful experience. This taught me that we always have to see both sides of the trade -- at least, if we want to survive. This is why I offer my preferred interpretation, but also try to see the other possibilities and provide levels which hopefully act as waypoints to indicate when the market is breaking from my projections and onto one of the alternate routes. I probably tend to caveat too much sometimes, but I feel this is a better approach than the alternative. People who've read me for a while eventually learn my language and grasp where I feel we're headed through all my "but watch out for this and that" warnings. I don't present alternate counts so that the outlook is "always right" -- in my mind when an alternate plays out over the preferred count, then that means I assigned my probabilities wrong -- I present alternate counts so readers can adjust on the fly and protect themselves where appropriate. A few times over the past couple months, I've talked in brief about the fact that the recent rally has shown some of the characteristics of an extended fifth wave. I haven't focused on that option however, because up until May 23, the larger wave structure had (in my opinion) remained pointed upwards for the most part. Sometimes it's hard to sort out the options too far in advance, which is one reason I'm a firm believer in staying nimble, and recognizing when the environment may be changing. For reasons discussed above, getting married to a long-term outlook can be an account killer. Everyone can see how the "let's marry our convictions" approach has killed the bears this year, as many kept shorting all the way up, convinced that the rally was "just about to end!" In tomorrow's article, I'll talk a little bit about extended fifth waves, since they can be big money-makers for traders and we may be unraveling one now. In conclusion, the long term presently remains pointed higher, but that may be irrelevant at the moment. We can't see around every bend in the market, but most times we don't need to: The near term appears to be pointed downwards, and the intermediate term, while too early to confirm, also looks likely for further downside. This is not a bad time to behave defensively. Let's start off with the near-term and build from there. I completed this chart after the close on Friday and posted it in the forums, and the futures action this morning has left both options still on the table. The biggest question in my mind is whether we're seeing the smaller wave (2) of the larger black (3) (on the hourly chart) or if this is a fourth wave correction with wave (5) of black (3) underway. I'm leaning toward the latter. With that thesis in mind, here's the hourly chart. 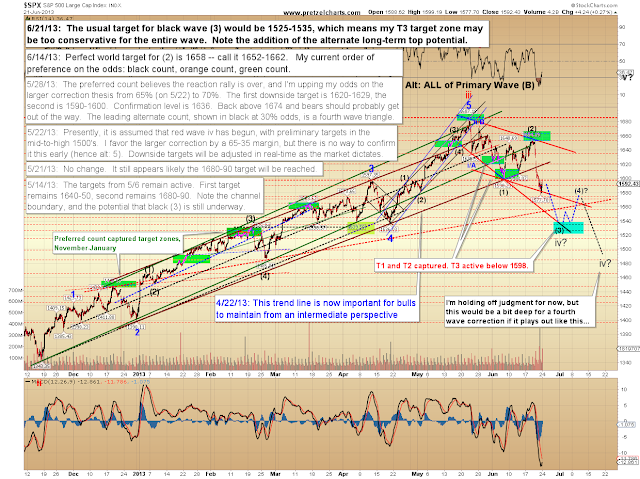 Not shown on this chart is what happens if the more bearish count is underway. 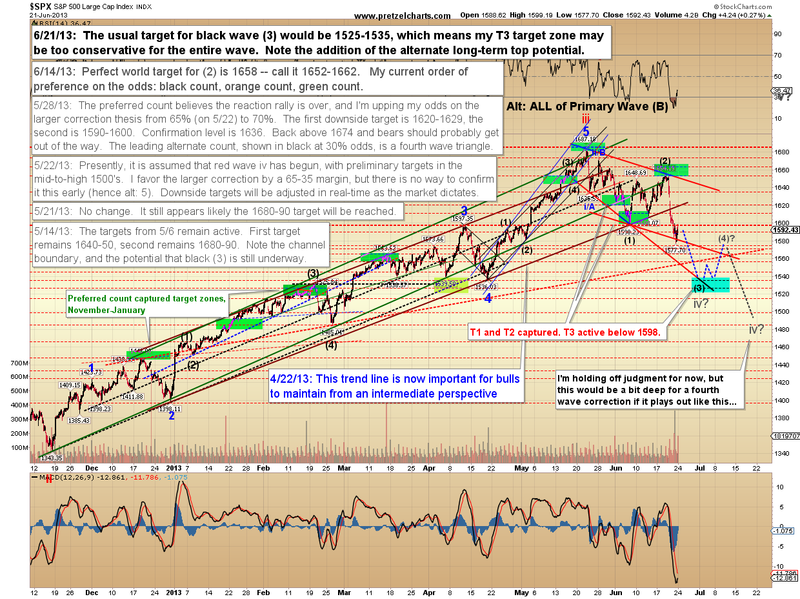 If the rally we just witnessed was actually blue wave (2) of black (3), then the next black (3) target zone is 1470-1480, with a final target in the low 1400's. I'm holding off judgment until I see how some other markets begin to shape up, specifically the Philadelphia Bank Index (BKX) and the Russell 2000 (RUT). I'll firm up my opinion on the above matter over the next few sessions. Be aware that markets often become very whippy around important levels, and the intermediate uptrend line on the chart below is one such level. 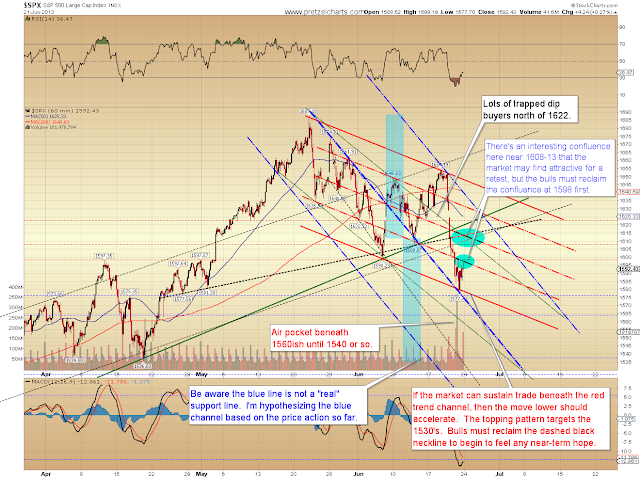 That trend line has held every decline since November, so the market may not be ready to let it go so easily, and may return to test it before moving much lower -- not shown on the chart below is what happens if wave (5) simply makes a marginal new low and then retraces 38-62% of the prior decline, perhaps to back-test the aforementioned trend line. 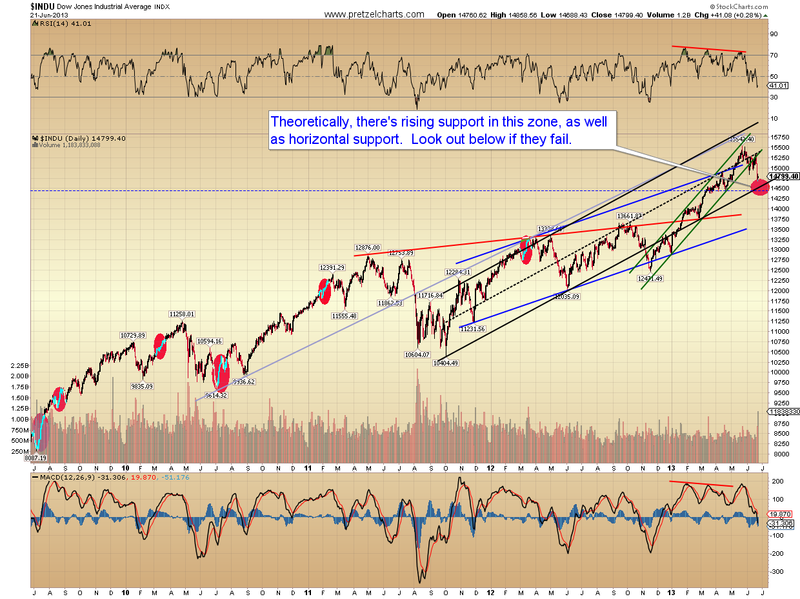 The long-term chart of the Dow Jones (INDU) shows support in the 14,400-14,600 zone. If the market is unraveling the most bearish count imaginable (the deeply nested third wave discussed above), then forget about support. There's just no way to know for certain yet -- as I said, I want to see how some other markets react to the pattern in the next session or two. 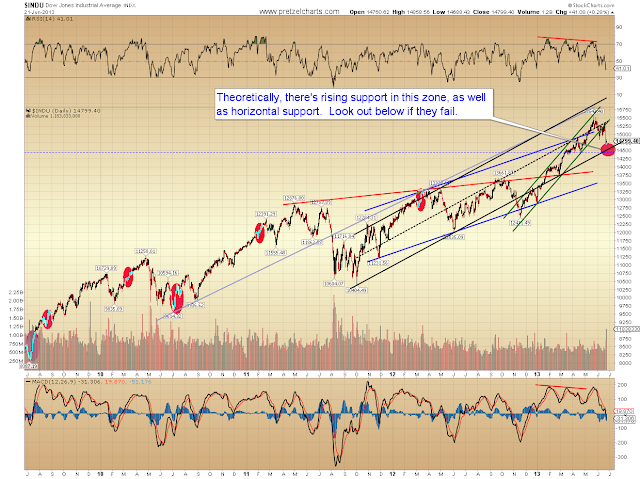 Below is a chart of SPX showing potential support/resistance zones and trend channels. The bond market looks to be in trouble, which is one sign (of several) that things may be cracking under the surface, and that the wave counts may be more bearish than shown. Again, we'll discuss those options further in the next update. Now, before we commit to the super-duper end-of-the-world bear view, it pays to be aware that there are several charts which are acting extremely non-committal to the bear case. 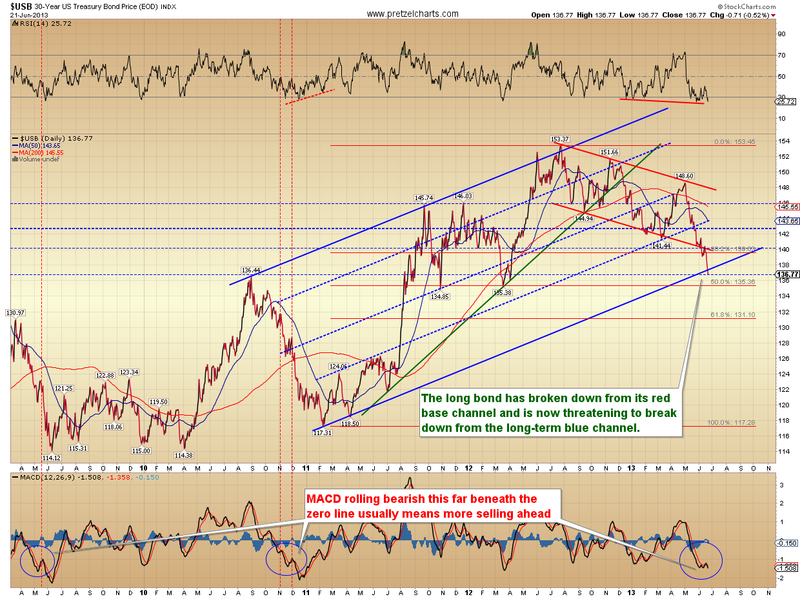 One such chart is the Philadelphia Bank Index (BKX) shown below. Unless BKX breaks down with conviction here, it has left itself three bullish options. One is near-term bullish, the other two are intermediate bullish. The option I'm not showing on this chart is for an ending diagonal, which would briefly break the 59.45 level, then rally back up toward the black "alt: (c)" label. In conclusion, several markets are still poised at inflection points across time frames. The patterns are set up that if things break, they could break in a big way -- in fact there is definite waterfall potential in the charts, which makes this a very dangerous market for bulls. But at the moment, a number of charts haven't actually broken yet, which means it's not a great spot for bears to become complacent. I feel fairly confident there are lower prices coming in the larger scheme of things, and that the T3 target zone will be reached -- it's more a question of whether this is going to turn into a mini-crash and head much lower, or if the market will rally along the way and move down in a more orderly fashion. The next few sessions should help clarify BKX (and some other indices), and give us a better idea of whether we should start thinking long-term bearish or not. Trade safe.